"Texas Peppers" - the Jalapeño cookbook, includes over 100 quality, tested recipes using the Jalapeño pepper. There are many that are 4 and 5 ingredients and easy to prepare. 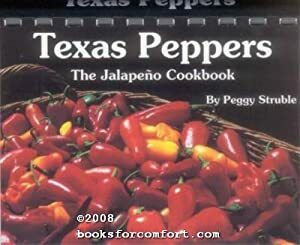 Included in this book is a list of Festivals around the state of Texas that include a celebration of the Jalapeño, a chart comparing the "Heat" of different types of peppers and history of the Jalapeño pepper. There are many, many recipes to be found that include these peppers; these are the best of the best for any occasion. The Jalapeño pepper can present the hot spicy kick it has the reputation for, or it can add a mild flavorful experience to a recipe. Texas Peppers contains over 100 delicious recipies that capture the distinct Jalapeño flavor. To embrace true Texas Cuisine, this cookbook is a must.